The Governments Planning Policy Guidance for Open Spaces (PPG 17) was drawn up to protect and safeguard open spaces, green spaces, and other outdoor recreational spaces from the threat posed by creeping urbanisation and the constant pressure towards uncontrolled and intensive development. Councillors and Council Officers have certainly paid lip service to this guidance in planning the KALC development, but their actions do not match their words. During the consultation for the planning brief they falsely claimed that the KALC project would satisfy the requirements of PPG 17. More recently, now that the architects have done their worst, they have begun claiming that the development will ‘create more green space by enlarging Lancaster Green’, and that it will deliver ‘more usable green space and an improved Lancaster Green’. 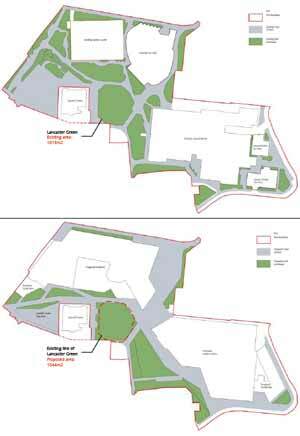 The maps on the left were included among the 105 documents submitted by the Council with the Planning Application. They show before and after views of the site. The green shading shows green-space and the grey shading shows hard-surface external space. The maps show clearly that there will be a significant loss of green space resulting from the proposed development. The Council’s claims to the contrary are quite simply wrong, and appear to be a deliberate lie intended to mislead the public. These statements, and others like them, have distorted the consultation process, enabling the Council to mislead many residents unfamilar with the Lancaster Green area into believing that the project has been well designed, that the needs of local residents have been properly and respectfully addressed, and that local opposition to the plans is just knee-jerk nimbyism. Nothing could be further from the truth. The character of the area, and it’s value and amenity to local residents, will be utterly changed. The massive Academy and Leisure Centre structures, and the paved areas that serve them, will completely dominate the landscape. This is, and always has been, an exercise in reckless and intrusive over-development which will be realised at great cost to the local community. We present below some extracts from the Minister of State’s Planning Policy Guidance for Open Spaces, aka PPG 17, and invite you to form your own judgement as to whether RBKC has had proper regard to this guidance in progressing the plans for the KALC project. Existing open space should not be built on unless an assessment has been undertaken which has clearly shown the open space to be surplus to requirements. ‘Surplus to requirements’ should include consideration of all the functions that open space can perform. areas of open space that particularly benefit wildlife and biodiversity. The recreational quality of open spaces can be eroded by insensitive development or incremental loss of the site. In considering planning applications, either within or adjoining open space, local authorities should weigh any benefits being offered to the community against the loss of open space that will occur. They should seek to ensure that all proposed development takes account of, and is sensitive to, the local context. We can see no evidence that the Council’s planners or architects have had the slightest regard to this guidance, nor to the Council’s own policies that were designed to respect and accord with the guidance.